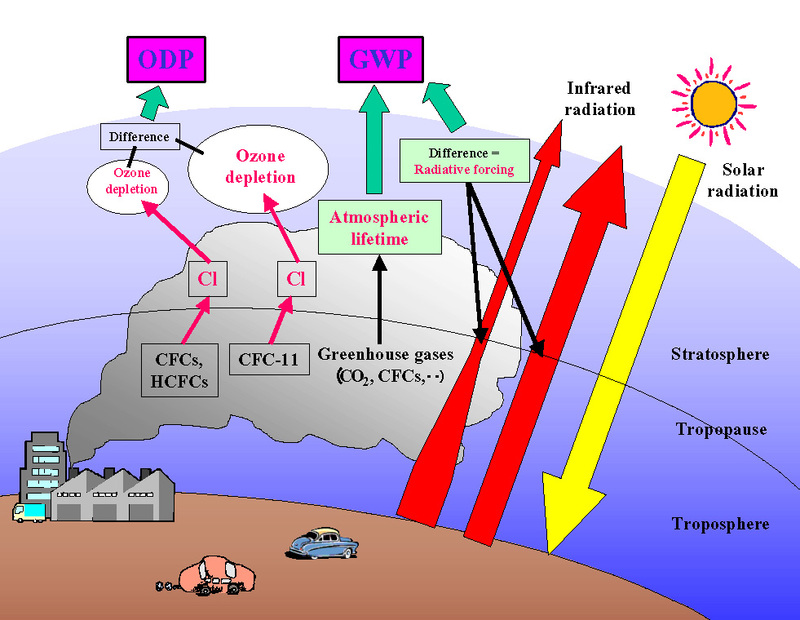 Ozone depletion is the most dreaded aspect of air pollution, having wide spread implications, extending over the entire atmosphere. 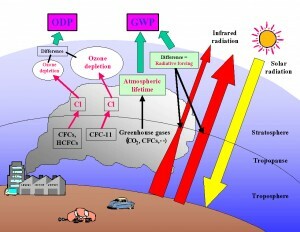 This problem is caused by the reduction of naturally available ozone layer in the atmosphere. Before we explain ozone depletion, we will like to summarize the contents of the gaseous atmosphere that exists above the surface of the Earth. It is nearest gaseous zone extending from the surface of the Earth up to an average distance of about 11km at the poles and 16 km at the equilateral regions. Temperature decreases with height in the troposphere, since the main heat source is the solar radiation which is absorbed at the ground level. The rate of decrease of temperature, called the lapse rate is about 5 degree Celsius/Km. the troposphere contains most of the water vapors, clouds, and storms of the atmosphere. Winds tend to be the strongest at the tropopause, the level of the jet streams. This is also the level at which the jet aircrafts cruise. The troposphere contains about three-fourth of the total weight of the atmosphere, and is responsible for most of the meteorological processes. Thus, it is the troposphere, in which winds are generated and clouds are formed, which cause precipitation. Above the tropopause (at about 10-16 km altitude) lies another zone, called the stratosphere, extending up to about 50 Km altitude, a point called the stratopause. Between the Stratopause (S) and Tropopause (T), the temperature increases gradually with height, from about – 80 degree Celsius to about 0 degree Celsius or so. At the stratopause (S), the temperature, in fact, is about as high as at the ground level. Its warmth is due to the absorption of ultraviolet radiation from the sun by oxygen and ozone. 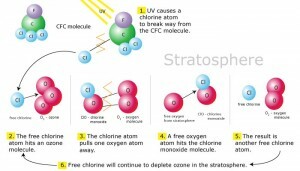 Most of the world’s ozone is found in the stratosphere, where it may exceed 5 ppmv (parts per million by volume). Hence, stratospheric air is lethal to human beings. There are very little water vapors at these heights. 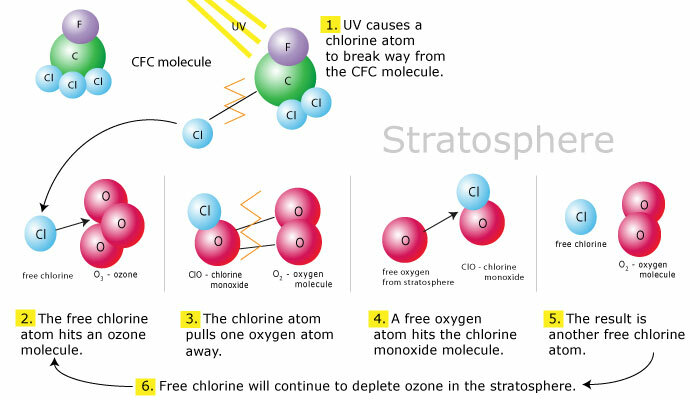 Ozone (O3) is, in fact, formed in this zone due to the splitting of an oxygen molecule (O2) to form O3 (Ozone). Ozone is, however, destroyed naturally by ultraviolet radiations, as it helps in preventing UV radiations from reaching the ground. In the stratosphere, ozone is, thus, constantly being formed and destroyed, and is, therefore, maintained in a rough equilibrium, under natural unpolluted environment. Since Ozone is formed in the Stratosphere, this zone is also sometimes called as the ozonosphere. The Ozonosphere is of utmost importance to the life on the Earth, as it absorbs most of the U.V. radiations from the sun, which in its absence, would possibly have burnt all the life on Earth. The mesosphere extends from the stratopause (S) at about 50 km altitude and at about 0 degree Celsius to another temperature minimum of about – 110 degree Celsius at about 80 km altitude. This top boundary of mesosphere is called the mesopause. The atmosphere in this zone is windy and turbulent, but there are usually too little water vapors for clouds to form. Above the mesopause (80 km altitude) the temperature increases indefinitely upward into the atmosphere (i.e. the hot upper atmosphere), which zone may extend up to about 500km altitude. The mesosphere and the thermosphere zones contain many ions (electrically charged atoms and groups of atoms) and free electrons. Cosmic rays and radiations from the sun produce these ions. Both these zones together are, therefore, usually referred to as the ionosphere. The ionosphere is a very light and rarefied mass, and as such, is very light is mass, despite having a large volume. Different types of subzones, such as D-region (55-90km altitude); E-region (90 to 145 km altitude); f1-region (145 to 305 km altitude) and F2-region (305 to 500km altitude) have been differentiated within the ionosphere, depending upon the degree of ionization. The region of the atmosphere beyond about 500 km, is called the Exosphere, and till today, very little is known about it. It is perhaps a low density, high temperature region, with minimum atomic collisions. As far as the chemical composition of the atmosphere is concerned, it has been found to be mainly a mixture of an approximately 78% Nitrogen and 20% oxygen by volume. Other gases like carbon-dioxide, argon, neon, helium, ozone, and water-vapor will constitute the balance 2%. This composition is fairly constant in the regions of troposphere and a large part of the stratosphere. Dust particles and liquid droplets are also found present in the lower atmosphere and water vapors may be present in large variations. Out of all the above described zones of the atmosphere, the second zone, i.e. the stratosphere, remains the most important to man, as it is the stratosphere which primarily contains ozone gas (O3), chiefly in the layers between 25 and 40 km above the ground level. This ozone layer cuts off short wave length radiations (called ultraviolet radiations) from reaching the surface of the earth.